BATON ROUGE, La. - The 2016 campaign season has finally ended, with Louisiana’s runoff election cementing Republican control of the U.S. Senate. The GOP also is holding onto the two U.S. House seats that were undecided going into the state’s runoff election. Republican state Treasurer John Kennedy’s victory Saturday gives the GOP a 52-48 edge in the Senate starting in January. His runoff campaign focused on his support for President-elect Donald Trump and opposition to the Affordable Care Act. Voters also chose Republican Clay Higgins, a former sheriff’s captain known as the “Cajun John Wayne,” in the 3rd District representing southwest and south central Louisiana. Republican state Rep. Mike Johnson won the 4th District, covering northwest Louisiana. Higgins had gained national fame for hosting a weekly “Crime Stoppers” segment for a local news show, where his tough talk earned him the “John Wayne” nickname. 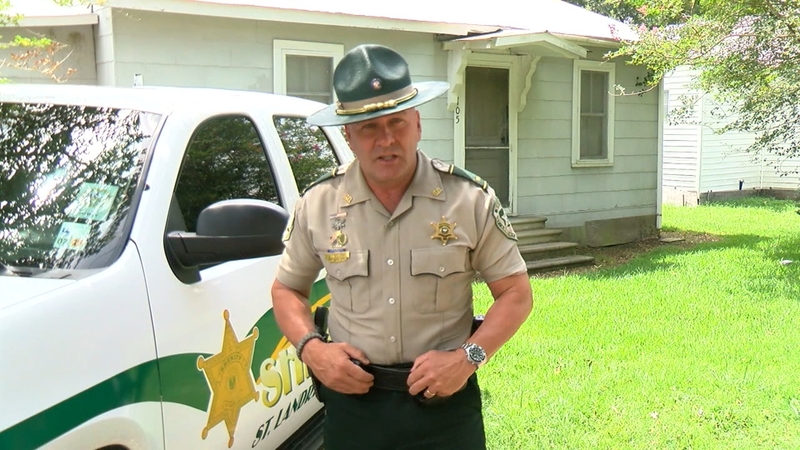 Higgins resigned from the Landry Parish Sheriff’s Office earlier this year, after causing controversy with his viral online videos. He said he resigned as a captain in the Sheriff’s Office “as a matter of conscience,” citing his faith as a primary motivator for moving on. In one of his famous earlier videos, Higgins spoke directly to thieves who robbed a store for cigarettes. Higgins’ home base is in Opelousas, Louisiana, the heart of Cajun country, famous for its music, cooking and culture. But Higgins said there’s not a drop of Cajun in him. Before he was chasing suspects, the New Orleans native was chasing money. That path, he said, led him to law enforcement. “I went from a job making $144,000 a year to making $8 an hour as a cop,” he said. Meanwhile, Kennedy entered the senate race as the front-runner and never relinquished the position, even when the field swelled to two dozen contenders in November. In the runoff, he defeated Democrat Foster Campbell, a state utility regulator who was such a long-shot that national Democratic organizations gave him little help. It was Kennedy’s third U.S. Senate run since 2004 and this time he won in a landslide, taking 61 percent to Campbell’s 39 percent in the low-turnout election. “With 52 seats in the U.S. Senate, we are excited for Republicans to confirm a conservative Supreme Court justice and begin working with President-elect Trump to pass an agenda of change for the American people,” a statement from Republican National Committee co-chair Sharon Day said. Kennedy declared that he represents change in Washington. Louisiana’s open primary system pits all candidates against each other and sends the top two vote-getters into a runoff when no one gets more than 50 percent. Mr. Trump and Vice President-elect Mike Pence both traveled to Louisiana to rally for Kennedy, and despite Campbell’s slim chances, he did get donations from around the country, aimed at bolstering resistance to the Trump presidency. The results keep Louisiana with one Democratic representative among its six congressman and two senators. The Senate seat was open because Republican David Vitter decided against running for a third term after losing the governor’s race last year. Both Kennedy and Campbell have been involved in Louisiana politics for decades. Kennedy, an Oxford-educated lawyer from south Louisiana, is in his fifth term as treasurer, and has repeatedly been in the headlines while clashing with Louisiana’s governors over state finances. Campbell, a cattle farmer and populist former state senator from north Louisiana who railed against “Big Oil,” talked openly about man-made climate change and argued for increasing the minimum wage. Though a Democrat, he opposed abortion and ran as supportive of gun rights. Two House seats were open because Republicans Charles Boustany and John Fleming unsuccessfully sought the Senate seat instead of re-election. The 3rd District race’s presumed front-runner had been Scott Angelle, a Republican member of the Public Service Commission and well-known public official for nearly 30 years. But Higgins - who made attention-grabbing Crime Stoppers videos as a sheriff’s captain - capitalized on disenchantment with career politicians to trounce Angelle with only a fraction of his money and a bare-bones organization. In the 4th District, Johnson defeated Democrat Marshall Jones in a competition that largely steered clear of attacks.